The College of Geosciences at Texas A&M University is pleased to announce the recipient of the 2016 Michel T. Halbouty Geosciences Medal, Dr. Gordon P. Eaton. 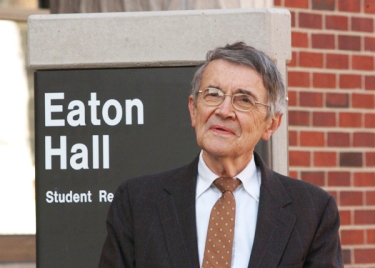 Dr. Eaton’s career spans over 40 years in geosciences as an educator, researcher, director, and college administrator. Gordon Eaton began as an assistant professor at Wesleyan University from 1955-1959. After accepting a position at the University of California at Riverside in 1959 and advancing to associate professor, he began an association with the United States Geological Survey (USGS) that would eventually lead to him join their ranks in 1967. At the USGS, Dr. Eaton held several positions – including serving as scientist-in-charge of the Hawaiian Volcano Observatory and project chief of the Southwestern Geophysics Project. Dr. Eaton returned to academia in 1981 when he was named Dean of the College of Geosciences at Texas A&M University. After just two years as dean, his leadership was quickly recognized – and promoted to Provost and Vice President for Academic Affairs. In 1986, he became President of Iowa State University and served until 1990, when he resigned to become the director of Columbia University’s Lamont-Doherty Geological Observatory. Dr. Eaton returned to the USGS in 1994 as its twelfth director after being appointed by President Bill Clinton. He retired from the USGS in 1997. Dr. Eaton has guided the helm of the U.S. Geological Survey and its community of scientists for over three years, during a dramatic sea-change for the Survey. Under his guidance, the USGS has expanded to become the preeminent science bureau for the Department of the Interior, one that now encompasses the disciplines of biology, geology, hydrology and mapping. In addition, he has been a tireless advocate for the Survey through difficult periods of downsizing, funding uncertainties, and transformation of its mission. I accept his retirement with regret and a great deal of respect. “Without a doubt, Gordon’s most lasting and most important contribution to the geosciences was the role of defender and protector of the geosciences in the U.S. Federal Government”, noted one of his nominators. Another nominator adds, “During Dr. Eaton’s tenure at Texas A&M, the College of Geosciences was actively pursuing, and eventually selected to be the Science Operator for the Ocean Drilling Program. This was by far the largest scientific research program that the College had ever been associated with. Dr. Eaton as Dean of the College and the Provost of the University was instrumental in bringing this prestigious program to the College of Geosciences.” Today the IODP is the largest federally funded research project at Texas A&M. The Michel T. Halbouty Geosciences Medal is conferred by the Dean, College of Geosciences for distinguished achievement in the development of earth resources and in the application of geoscience to the discovery, use and conservation of earth resources. The award will be presented at a gala celebration on the evening of Friday, November 11, 2016 at Texas A&M University in College Station, Texas.